On Friday Dominic and I were finally able to bring Olivia to her eye appointment. I had accidentally missed the last appointment so we’ve been waiting a while to see this doctor! Like I said in the last post about her eyes, they have been tearing since about 2 month. She has a blocked tear duct which basically means she’s producing a lot of tears and majority of them are being blocked, not allowing them to flow through, thus making her have super watery/teary eyes. I constantly get asked why she’s just been crying and 98% of the time, there’s absolutely nothing wrong with her. Our pediatrician said we had to wait to look into it until she was one and honestly, now that it’s here, and we’ve gotten it checked out, I’m not so sure I liked what the opthamologist told us. After she did the test, she looked into her microscope to see what the swipe test revealed. It confirmed that she did have a blocked tear duct. She told us that it can take up to 18 months for the blocked duct to correct itself (our ped. told us 12 months) and that while this is very common in babies, Olivia’s case isn’t as severe as she’s seen in the past. Which is great to hear. She told us that she’d like to keep things as natural as possible, and try to correct it ourselves before talking about surgery. I know you’re probably wondering why I am pushing for a surgery…. I’m really not. There is nothing I want more than to fix this naturally, because even the mere thought of Olivia in an operation room makes me cry. I am just really stubborn and want her eyes to be fixed already. But of course we will take the natural route. The natural route includes massaging her duct with a warm washcloth about 14 times a day. My child is going to hate me about 14 times a day for the next month, but I’m okay with that. She’ll thank me later. We go back to see the doctor in one month, she’ll do the same ridiculous test, and then if she thinks it’s getting better, we’ll have to keep doing it and hope it goes away by the time Olivia is 18 months, and if it shows no progression, then we’re going to have to talk about surgery. Has anyone else ever experienced anything like this? P.S. 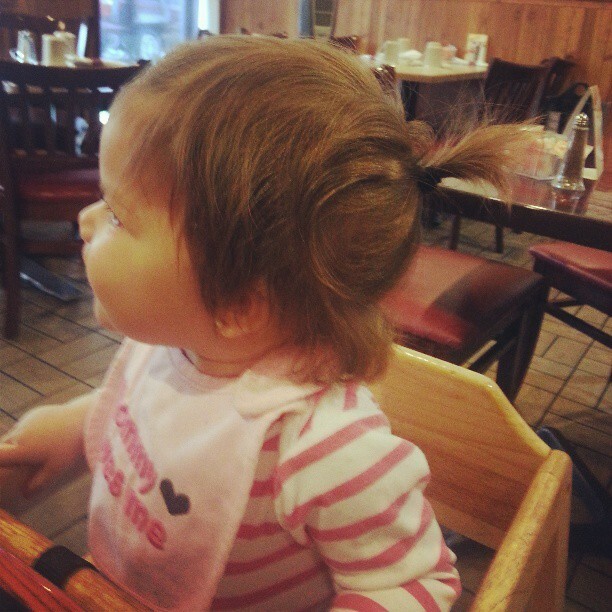 We put Olivia’s hair in a pony tail yesterday for the first time….she looked so cute (and so much older!)! Love the ponytail! I’m sorry about the blocked tear duct. Emmeline had that when she was little, but it went away fairly quickly with the massaging. Hopefully, Olivia’s will go away on its own soon so you don’t have to worry about surgery!